Pencils, crayons, backpacks and brand new notebooks waiting to be filled up with newly-learned things - ahhh, how wonderful. My kids may not be old enough for school yet, but that doesn't mean I want to miss out on all the fun that comes at back to school time. 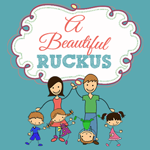 My hubby and I plan to homeschool our kids, and we talk about it all the time! Andrew is even more excited than me - he has lists of books for them to read, places that we will visit, and skills they need to know. I know that I will get more into the planning process once we are a little closer to Pre-K - right now, I have enough on my plate just trying to keep up with laundry! When I do start planning, though, I think the most fun will be coming up with crafts and activities for our kids to do. And if I know anything about the way things work in our house, a lot of those projects will involve Duck Tape®. I've been a fan of this amazing stuff since I was 15, when my friends and I put together a reasonably realistic-looking pipe organ with toilet paper rolls and Duck Tape®. Oh yes. It was awesome. These days, I use Duck Tape® to tag my hangers at consignment sales, to label props for my drama students, and to decorate packages that I send in the mail. 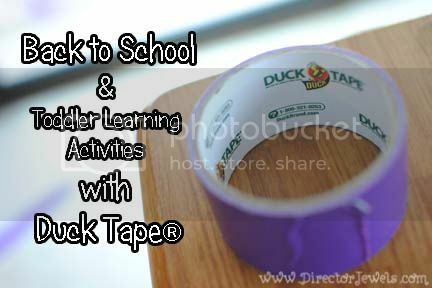 You'd better believe that we will buy Duck Tape at Walmart - it will be a staple on our homeschool shopping list! Every time I shop at Walmart, I stop to admire all of the pretty varieties of tape. I think I need them all! In the spirit of back to school, I wanted to give Lincoln a new task that would help him work on his fine motor skills - preparation for when he learns to write! 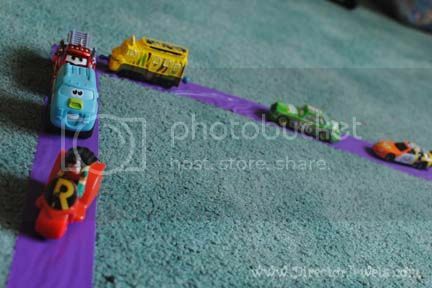 So I got out a trusty roll of Duck Tape® and in just a few minutes, created a purple road that stretches all around our living room and kitchen! 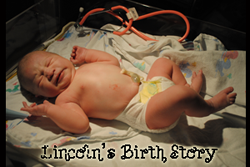 Lincoln was pretty wowed by my awesome mom creativity, and has been playing with the track non-stop! 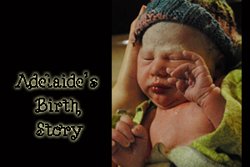 We've already come up with a variety of educational ways to use this project. In addition to helping with fine motor skills by pushing cars along the track, we've been working on balance (think of it as a really crazy tightrope)! The only color I had on hand when I made the track was purple, but next time we visit Walmart, I plan to purchase several more. Color recognition is a big deal at our house right now! It would be really simple to add additional elements of fun and learning to this project. Next time I make a Duck Tape® track, I think I will create several shapes from different colors of tape, and string them together with a neutral color like black or white. You could even make a Duck Tape® alphabet! 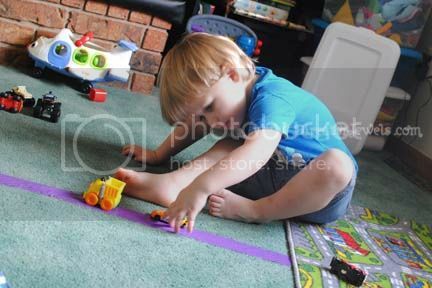 This sort of game is perfect for my two and a half year old, and even the baby has had a blast crawling along the tape track. 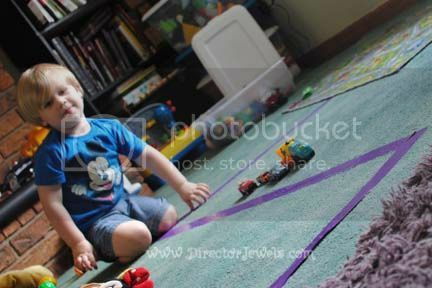 Thanks to Duck Tape®, we're having all kinds of toddler learning fun! Do you love Duck Tape® as much as me? Make sure you are following @TheDuckBrand on Twitter to see all the latest updates and offers! I've always said the #1 survival tool is duct tape! I love that you can get different colours now. Just wondering: how did it come off the floor? Um it's actually still on my floor, and that is something that did not cross my mind before I put it down! :p Lincoln has had so much fun with it, though, that I won't mind if I have a little stickiness to clean up when we're done with it! How cute to use it as a little road for toy cars!!!! I'm about to buy a lot of duct tape since we are moving soon! Definitely have to have some on hand when moving! I know! I can't wait until they're old enough for craft projects too. So much fun! Duct tape is probably one of the greatest inventions ever and how cool are all of the colors and designs it comes in now? I love the designs, too. I am always SO tempted to throw a few rolls in my shopping cart! What a fun idea...I never think to do things like this. I'm sure even my older girls would play with it! What a great activity! I've always said there are a million uses for a duct tape, but this is a new one! It really can be used for just about anything! What a great idea! My 6 yr old is always trying to make tracks for his Lego cars etc - this is brilliant and something he could enjoy doing independently also! I think this idea has endless potential... I'm going to have to do it again when my kids are old enough to help make it. The track could go down my staircase and cover two floors of the house! Haha! My toddler gets excited when I give her a piece of plain tape to wear like a bracelet. 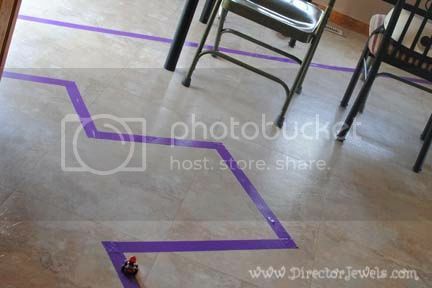 She would go wild for a purple tape race track. Thanks for the inspiration. You bet! Hope you have fun if you try it! What an ingenious idea, would never have thought of that. Seriously, the most creative way I've ever seen tape used! Great post! I never would have thought of these!